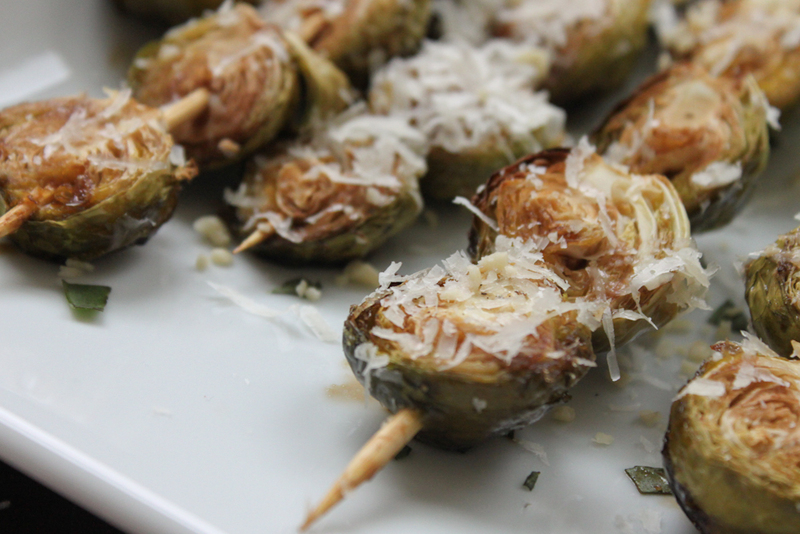 I took this recipe straight from Bay Area Bites as it incorporates many things I love: Brussels sprouts, cheese, and food you can eat with your hands! Brussels sprouts are flavorful, mini cabbages that roast up into crispy on the outside, tender on the inside, orbs of pallet pleasing nutrition. This recipe calls for cooking and serving the sprouts on skewers, making them perfect party food, or maybe a fun way to get your kids (roommates, spouse) interested in eating green veggies. If you don’t have skewers, don’t fret, you can simply skip that step. If you are avoiding as much sugar as possible use Apple Cider Vinegar in place of the balsamic. Photo from Bay Area Bites: Sprouts on a stick! Trim and peel away the outer leaves of each Brussels sprout and then half them. 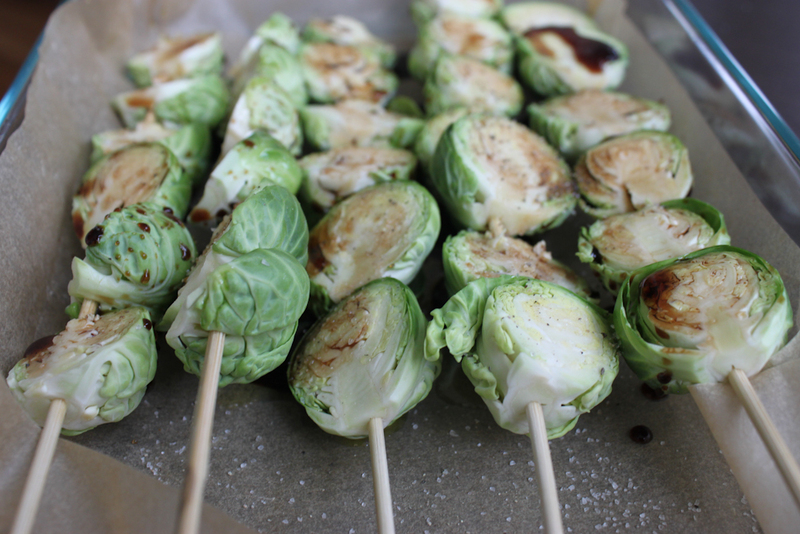 Slide the Brussels sprout halves onto the skewers, about six to eight halves per skewer. Line a baking dish with parchment paper and places the skewers halved-side up. Drizzle olive oil and balsamic vinegar over each skewer, trying to “fill up” the Brussels sprouts. Bake the skewers at 400 degrees for about 30 minutes until they are cooked and crispy. Plate the skewers on a serving tray and cover them with shaved Parmesan and the pine nuts. Original post can be found HERE! Does the candida diet allow parmesan cheese? Also I was told to stay away from Balsamic Vinegar? Anyway, it looks delish! Balsamic vinegar is a bit sweet, as I state in the post, if you are on a very strict diet, use raw, living apple cider vinegar instead. Thanks for reading!